For a long time now, I've dreamed of growing a Shakespeare garden planted with flowers and herbs from the works of William Shakespeare -- poppies, pansies, primroses, violets, carnations, cowslips, roses, rosemary, rue, daffodils, irises, columbine, marigolds, etc. Alas, creating such a garden takes more energy, time, and money than currently available to me so I make do with the fabulous coffee table book, Shakespeare's Flowers by Frances Owens. 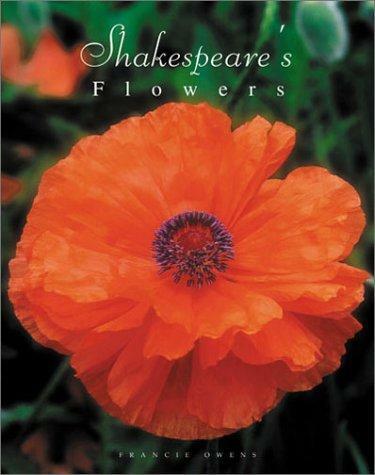 Shakespeare's Flowers consists of not much more than single or double page spreads of beautifully photographed flowers accompanied by a relevant Shakespearean quotations. "Nay, by my faith, I think you are more withholding to the night than to fern seed for your walking invisible" from Henry IV, Part I next to an exquisite closeup of a tightly coiled fiddlehead fern, for example. It's all beautifully put together and I can't see anyone not oohing and ahhing. 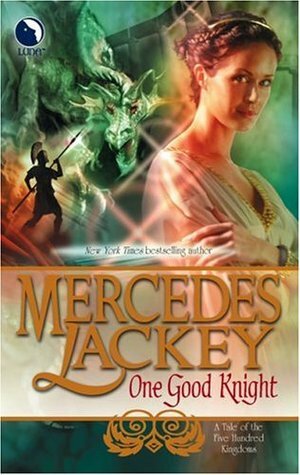 Today, I am reading Mercedes Lackey's One Good Knight, the second fantasy novel in the Five Hundred Kingdoms series, following The Fairy Godmother. If you're at all familiar with fairy tale cliches (referred to in these novels as The Tradition), you won't need to have read The Fairy Godmother to understand what's supposed to happen in One Good Knight -- there's a Princess (the daughter of a Wicked Queen) who is supposed to be sacrificed to a Dragon, but is rescued by a Champion, etc. 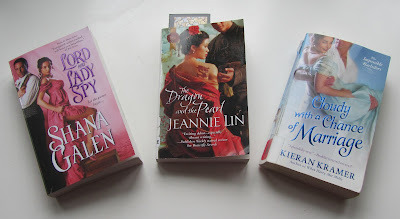 I say "supposed to" as the Five Hundred Kingdom novels are all fractured fairy tales and The Tradition is frequently undermined or manipulated by characters who won't accept their particular Happy Ending. 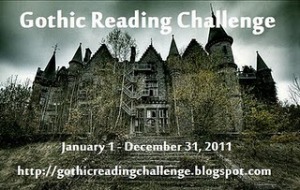 The last book I read was Kady Cross's The Strange Case of Finley Jayne, a free ebook downloaded off Amazon. This is a prequel to Cross's The Steampunk Chronicles and, if it is anything to go by, the entire series must be pretty fantastic. Finley isn't your average Victorian miss -- stronger than humanly possible, she sometimes feels possessed by a dark force that drives her to do bad or imprudent things. This, of course, has made it a bit hard to keep hold down respectable jobs and she is surprised to get an offer from a wealthy upperclass woman to become her daughter's paid companion. The woman is concerned as her daughter has recently become engaged to a man who may not harbor the best of intentions toward his intended. 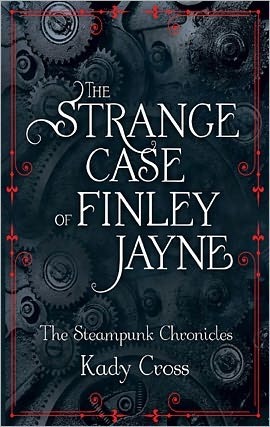 The Strange Case of Finley Jayne is a highly entertaining combination of steamworks and Society, pretty dresses and mad science, frothy romance and bloody-minded murder. 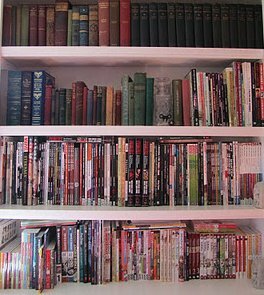 Wouldn’t this be a repeat of “Day 1: What is your favorite book?” A repeat doesn’t sound very interesting so how about I talk about my favorite manga, instead? The manga series, Emma by Kaoru Mori, follows the adventures of a young orphaned Victorian housemaid who falls in love with the eldest son of a very starchy upper class family. It's a fantastic story (think Upstairs, Downstairs with a heavy dose of Dickens and Bronte) told extremely well with such detailed and historically accurate illustrations that I could spend many happy hours just looking at the pictures. Emma has been made into an anime and you can watch the first season on YouTube. It's a lot of fun! 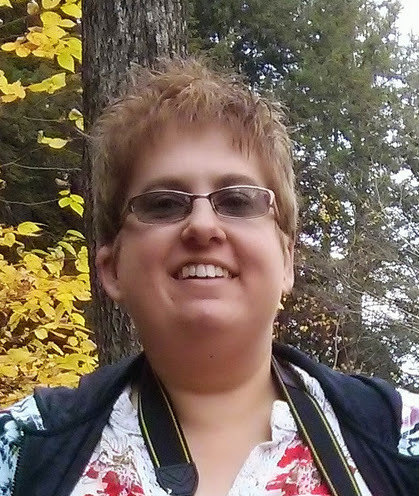 Well, I’m very fond of Pillsbury's Slow Cooker Recipes. When it was first published, I borrowed it from my library so much it might as well have been out on permanent loan to me! As this really wasn’t fair to other library users, I eventually did the right thing and bought myself a copy. While I've bought or borrowed tons of cookbooks since then, Slow Cooker Recipes remains one of my favorites. Its recipes are fairly pedestrian and that's fine by me. While I love looking at newer, trendier slow cooker books that utilize more exotic ingredients and additional cooking methods, they're not books I really want to cook from. To me, slow cooking is a time saver and I should have to do as little prep work as possible before turning on my slow cooker -- I don't want to do any precooking and I should never find myself driving around town in a mad quest for a difficult-to-find ingredient. The dishes that come out of my slow cooker don't need to be fancy or particularly photogenic, they just need to taste good and be ready when I want to eat. 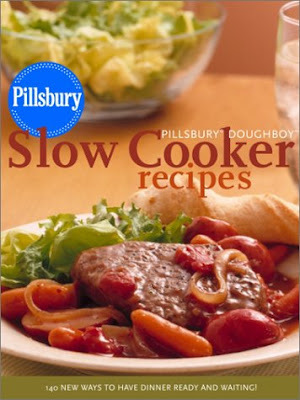 Pillsbury's Slow Cooker Recipes gives me that. My copy of Slow Cooker Recipes is seven years old now, but I still cook from it regularly and I expect to keep cooking from it until it falls apart. But I digress. 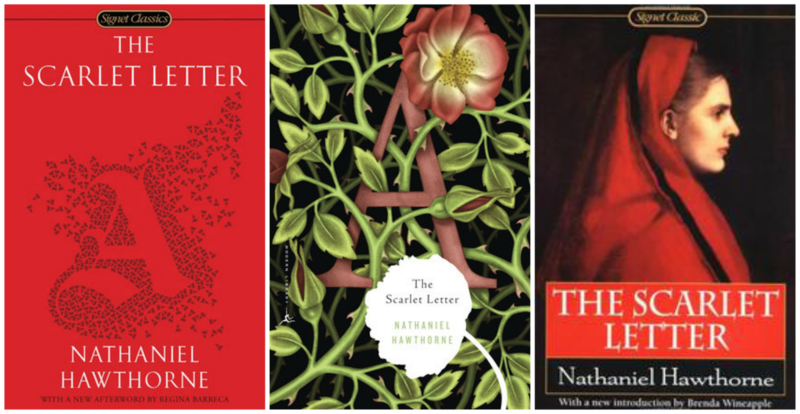 Fifteen-year-old me thought The Scarlet Letter was terribly, tragically beautiful. I read it twice through for my own pleasure and was ecstatic when it was assigned in class. Even the essay I had to write about symbolism and meaning in The Scarlet Letter did not kill my liking of it. We will wander gay and free." Again silence came and was unbroken while Barnum of his own accord turned north toward the house. Then Laura said, "I've sung for you, now I'll give you a penny for your thoughts." "I was wondering ..." Almanzo paused. Then he picked up Laura's hand that shone white in the starlight, and his sun-browned hand closed gently over it. He had never done that before. "Your hand is so small," he said. Another pause. Then quickly, "I was wondering if you would like an engagement ring." 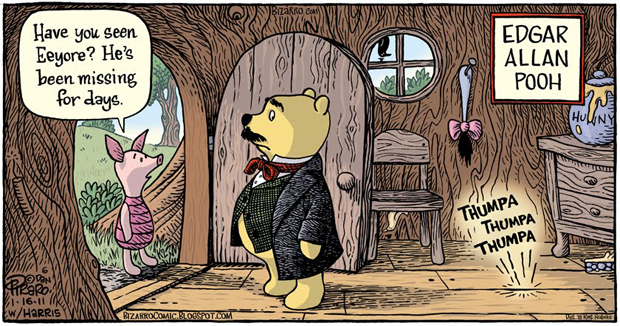 It might not look like much if you haven’t read the Little House books, but trust me when I say this is one swoon-worthy scene. 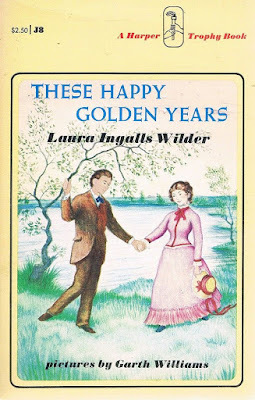 For years now, Almanzo had been courting Laura but she had been so frustratingly naïve about the whole thing -- during her first teaching job, he comes way out into the sticks in the dead of a bitter winter to fetch her home every weekend and she excuses his behavior as a favor to her Pa! Cherry Jones does a brilliant job reading this scene in the audio version of These Happy Golden Years – there’s hesitancy to Almanzo’s voice and a hitch in Laura’s that really brings it home. 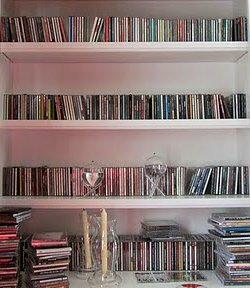 (Oh, I know, I am hopelessly off track with this challenge and today is much closer to being “Day 42” than it is “Day 24,” but what can I say? I am a bad, bad blogger).